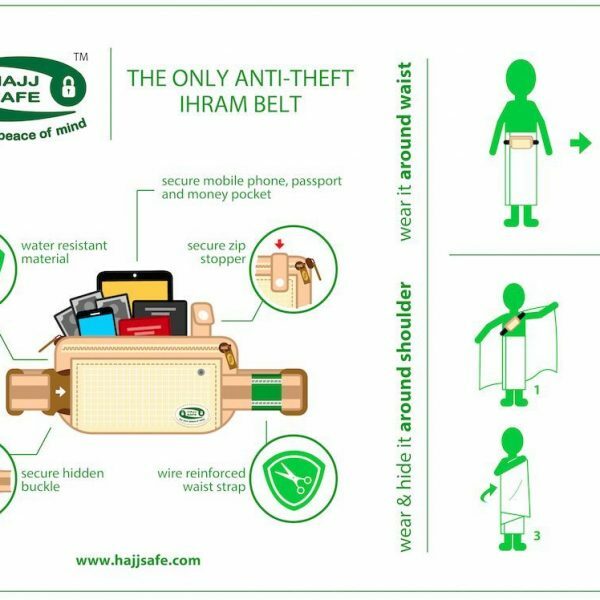 This Ihram Belt is the ideal way for keeping valuable’s safe such as Money, Passports, Credit/Debit Cards, Keys, Cameras, Phones etc. SKU: 63. 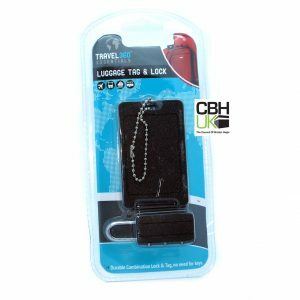 Categories: Men, Travel Accessories. 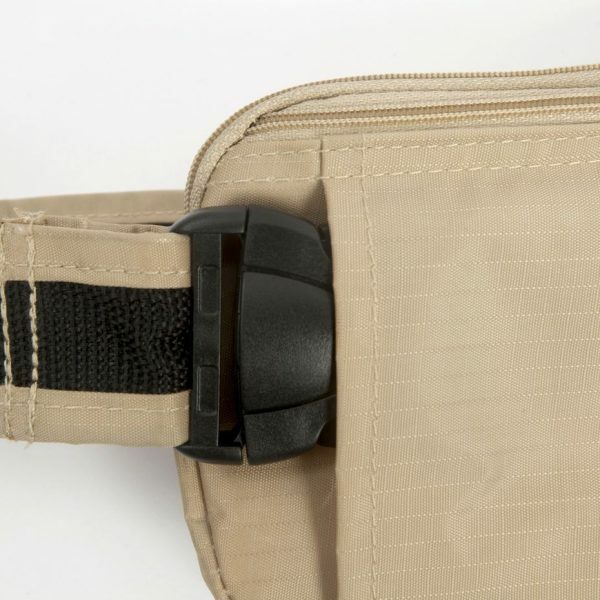 This Travel Belt is the ideal to be used as a Belt to Hold your Ihram up. 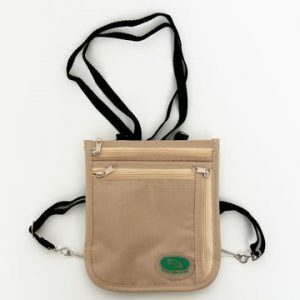 Also for keeping valuable’s safe such as Money, Mobile Phone, Credit/Debit Cards, Keys. 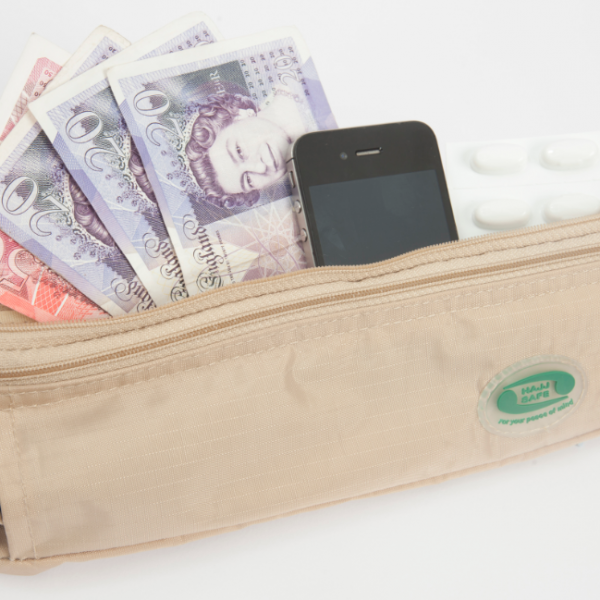 This is an excellent anti-theft money belt, to be worn when travelling or at any time a money belt is needed. 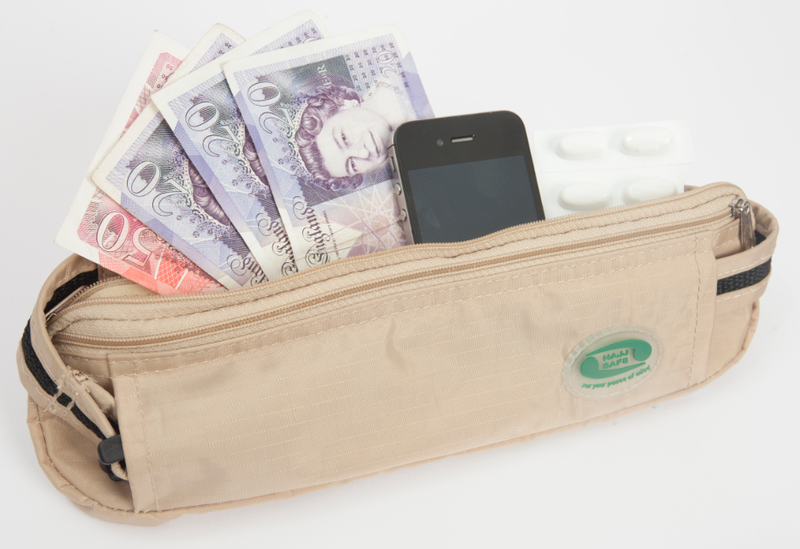 The pockets on it allow a wide range of Money, Mobile Phone, can be carried safely. This Belt can NOT hold most Passports. 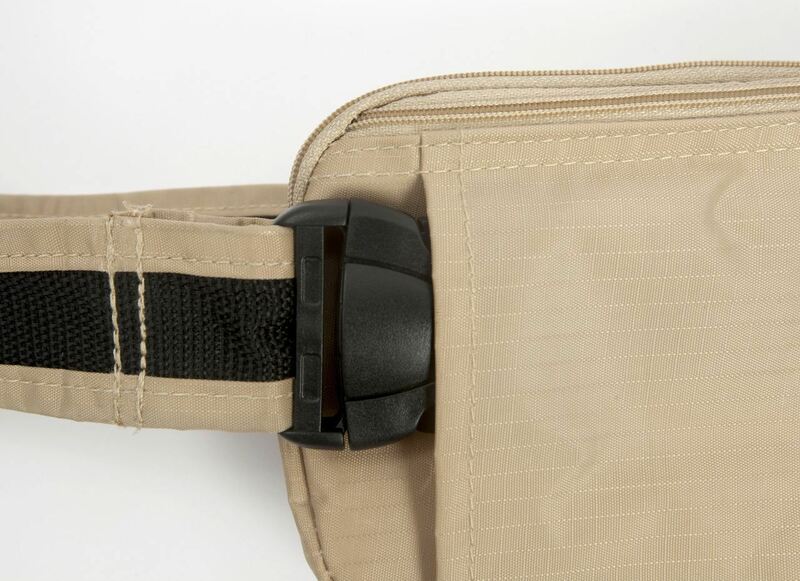 The WIRE Re-Enforced within the waist strap means it is slash proof making it extremely hard for anyone to cut the strap while you are wearing the belt. 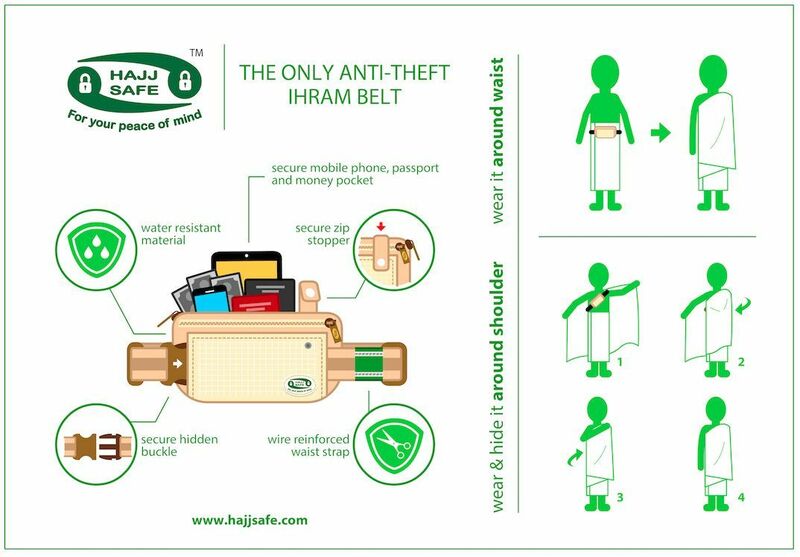 These Ihram Belts are wire reinforced making them slash/slit proof. This is important as there have been many cases were people have had their bags cut and stolen. 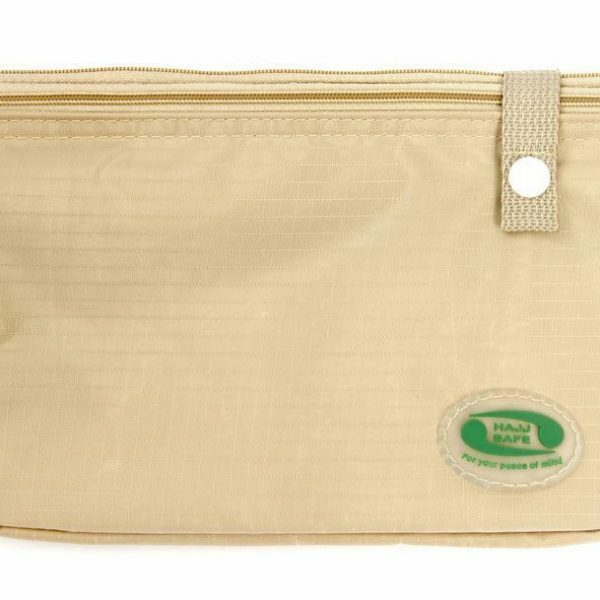 Hajj Safe Waist Bags are Anti-Theft Hajj Waist bags making them slash proof for Hajj and Umrah. 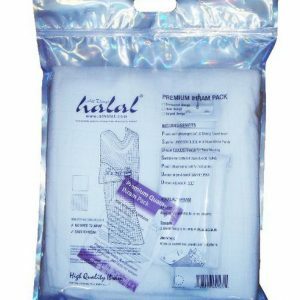 They can be worn over the Ihram or used as a belt to hold the Ihram up. 3. Strong Water resistant material. 4. Secure pocket to keep your money. 5. 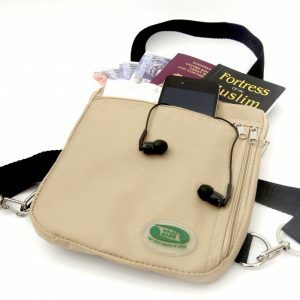 Secure pocket to keep your mobile phone.